Although the other members couldn't be present in this trip, Golden Melody Award organizer still extend their lavish hospitality towards their honourable guests. 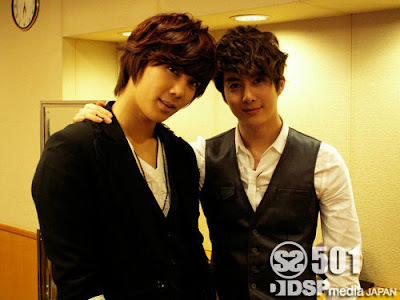 SS501 member Park Jung Min and Kim Hyung Jun have decided to support the Golden Melody Award. They will not only participate in the red carpet ceremony but also will be presenting awards (Best Group & Best Composer) on stage! Park Jung Min & Kim Hyung Jun have expressed that they are very thankful! They will arrive in Taiwan on June 25, Friday, 7pm, by Thai Airways. It is estimated that after attending the Golden Melody Award, they will return to Korea on the next day, Sunday, June 27. Although the whole team members could not come, but their fans will remain unchange in their support towards SS501. During their 2 weeks album pre-order, it has received the No. 1 ranking in Taiwan largest internet sales portal - book.com.tw book store's 'Real Time Hot Sales Chart' & 'Weekly Sales Chart'! In addition, their main theme 'Love Ya' has won the champion for both FETnet and Myfone ringtone download! SS501 member Park Jung Min & Kim Hyung Jun will arrive in Taiwan by Thai Airline at 7pm, Friday, June 25. They will attend the Golden Melody Award on the next day and will take part in the red carpet ceremony. In addition, they will also be presenting Golden Melody awards together with Ken Chu. Although they will not perform on stage, both of the boys feel very honoured for being able to participate in the red carpet ceremony and also giving out awards on stage. In addition to it, they are also very happy to be able to meet with Taiwan's most prestigous music artist during the award ceremony! The organizer has also extend their greatest hospitality towards the member and also all Korean staff, applying VIP custom clearance and also booking their stay in the Presidental suite of Grand Hyatt Taipei. Just like how Park Jung Min & Kim Hyung Jun has rendered their full support to the Golden Melody Award, Taiwan's Pea Princesses (SS501 fan's nickname) will also give their full support to SS501! Making their promises to meet during the Saturday, June 26, Golden Melody Award! SS501 'Destination' Taiwan Exclusive Limited Edition (A) & (B) album, will officially release in Taiwan on Saturday, June 26. After 2 weeks' pre-order, it has won the No. 1 for Taiwan's largest internet sales portal - books.com.tw book store's 'Real Time Hot Sales Chart' and also 'Weekly Sales Chart'. Upon hearing this, the members are touched and thankful for the full support rendered by their Taiwan fans. A lot of passionate Taiwan Pea Princesses have even called up Taiwan Warner Music, to enquiry whether they could pass their gifts to the members. To this, the members expressed: "Thank you for the passion of the fans, but hope that the fans would not spend on them." SS501 team (Jung Min, Hyung Jun & staff team) will take the Thai Airways TG635, arriving Taiwan at 7pm, Friday, June 25. They will be leaving on 12:50pm, Sunday, June 27 by Thai Airways TG634 to Korea.